Versatile secondary containment for small containers and packages Counter top spill containment tray safely stores bottles, beakers and other lab ware Makes decanting of small quantity liquids safer, cleaner, and more manageable. Features built-in pouring spout to conveniently remove spills. Designed for use in research, laboratory, medical, and industrial facilities. Versatile secondary containment for small containers and packages You won't find 55-gallon drums on top of most laboratory countertops. So, it goes without saying that you're even less likely to find a spill pallet on those countertops. But that doesn't mean there's not a need for spill containment for the smaller containers that are commonly used in labs, research environments, and medical facilities. 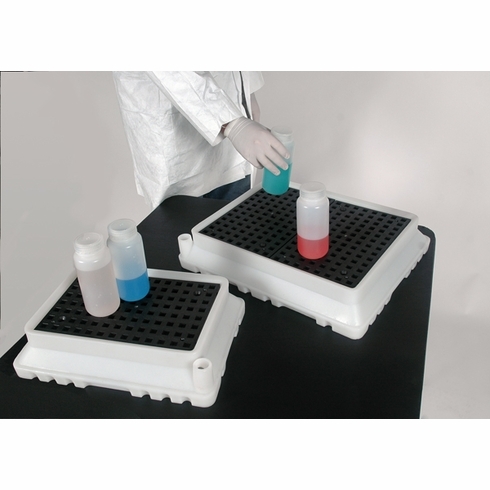 The Ultra-Spill Trays provide countertop spill containment of up to 2.9 gallons for jars, beakers and other smaller containers. The Tray's grating keeps containers out of any spillage and is easily removed if any cleanup is necessary. A built-in spout makes removing any spilled liquids quick and easy. Countertop spill containment tray safely stores bottles, beakers, and other labware Makes decanting of small quantity liquids safer, cleaner, and more manageable. Features built-in pouring spout to conveniently remove spills. Designed for use in research, laboratory, medical, and industrial facilities. All polyethylene construction provides excellent chemical compatibility Removable grating makes clean up quick and easy.